In the magazine article, “What is the future of the arts in Brazil?,” published in 1952, Djanira shocked the art establishment by stating: “We Brazilian artists have the history of our culture as example. 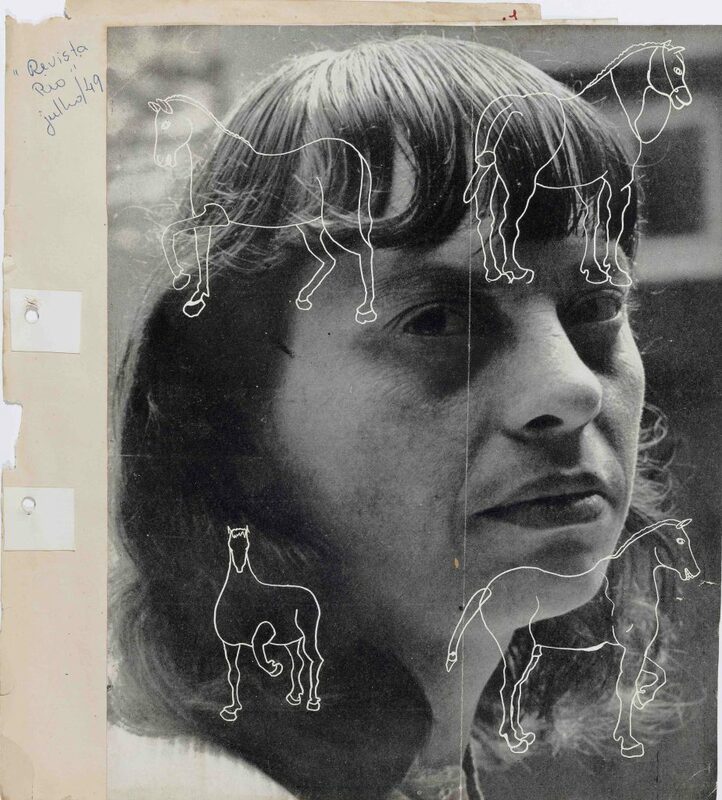 (…) We eat churrasco and vatapá but insist in painting European still lives.” Djanira da Motta e Silva (1914-1979), otherwise known simply as Djanira, targeted the buttoned-down art critics and artists who coined her paintings “naïf” or “primitive,” in the view of the well-known now-deceased São Paulo Bienal curator Walter Zanini. After all this time, what now stands out is the sociological content underneath the meticulous brushstrokes on her well-defined color areas that documents faceless figures of the human fabric of mid-twentieth-century Brazil, frozen in canvases with explanatory titles. 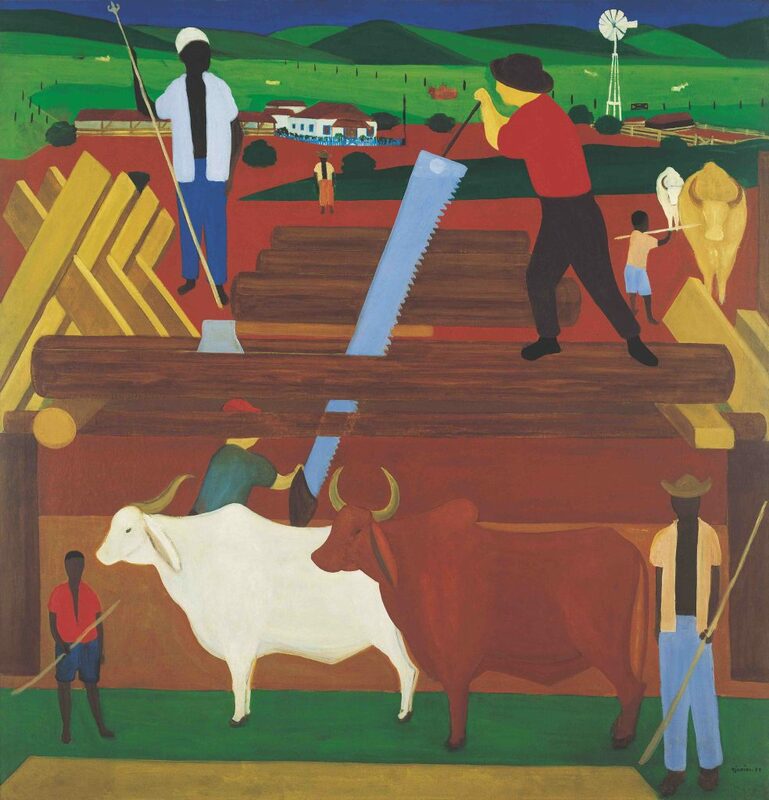 Among seventy works on display are “Serradores” (Wood Sawyers), “Vendedora de Flores” (Flower Girl), the outstanding “Trabalhadores de Cal” (Lime Kiln Workers), and Afro-Brazilian themes such as “Três Orixás”(Three Orishas) or the magnificent wooden panel “Candomblé,” a gift for Brazil’s best known modern Brazilian writer, her good friend Jorge Amado. In her lifetime, with exhibitions in France, Germany, Switzerland, Holland, Austria, Uruguay, the States, and at the 2nd São Paulo Bienal, Djanira—who I met because of my family ties with her Dalmatian, Horácio—was last shown in 1977, two years away from her death, in Rio de Janeiro at the Museu Nacional de Belas Artes. The MNABA holds the artist’s largest collection, many of them now hanging at the MASP retrospective. In June, the exhibition continues to Rio’s beautiful pink colonial-style Casa Roberto Marinho, a foundation in the surrounding area of the Christ the Redeemer statue, not far from where she began as a painter in 1940. 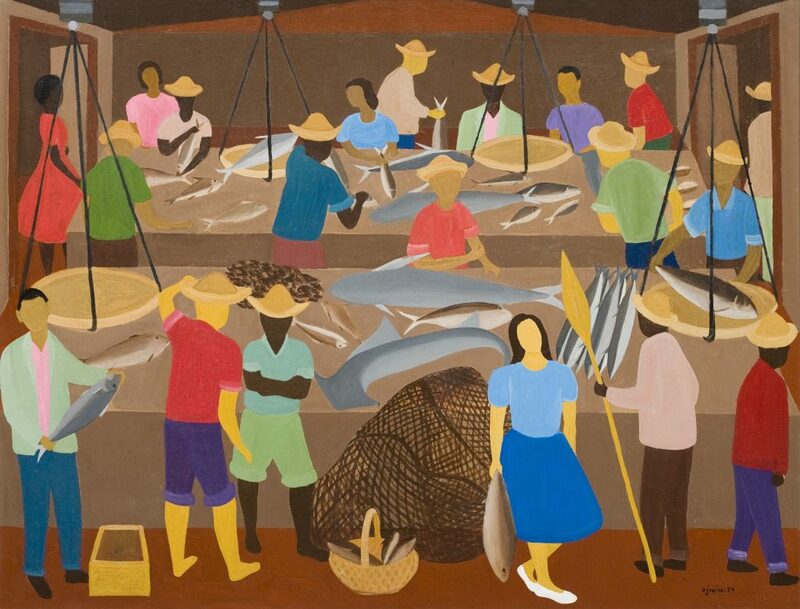 Two years later in her first collective show, her work “O Frevo” caught the eye of American tycoon Nelson Rockefeller in his first visit to Rio, then Brazil’s capital. Her work caught the attention of another prominent US citizen, First Lady Eleanor Roosevelt, as forty-three-year-old Rodrigo Moura reveals below. 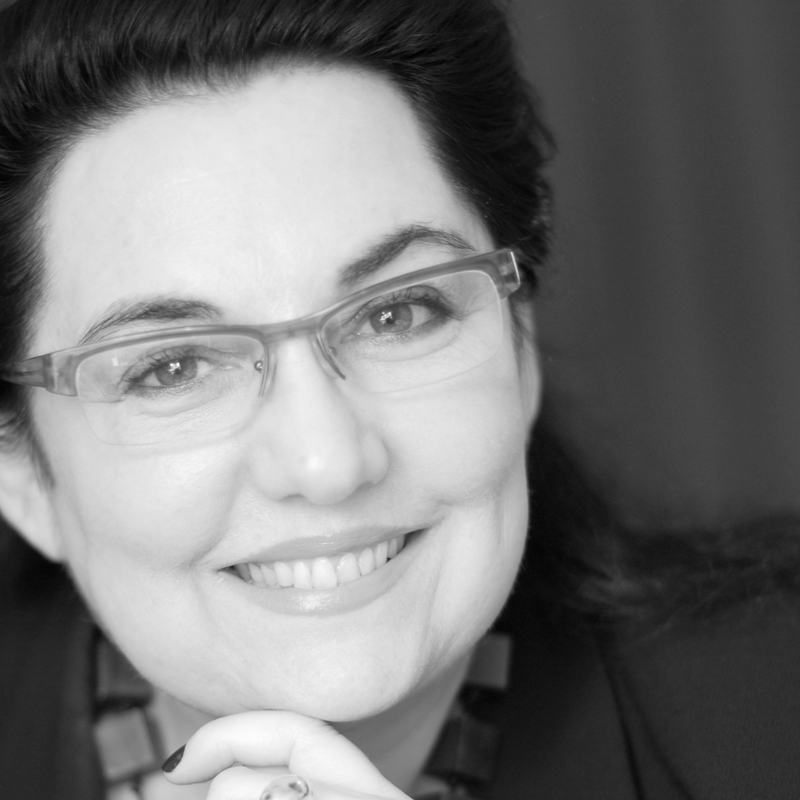 The Minas-born art professional, curator of Inhotim from 2004 to 2016, now leaves the MASP to be chief-curator of Museo del Barrio in New York. Rodrigo, to what do you attribute that Djanira, so well known in her days, was cast aside for forty years from the art circuit? Would it be due to sexism ingrained in the arts? It is probably due to several factors. I don’t attribute it to sexism since we had several Brazilian women artists from the same period who received posthumous acclaim. On the other hand, our art critique in general had an orthodox view of art regarding the popular themes of Djanira’s paintings as being drenched in folkloristic content thus the depth of the content of her work was overlooked. After her death her work stopped circulating in the market and her name was cast aside or people were simply unaware. The young Djanira worked as a farmhand in the states of São Paulo and Santa Catarina. 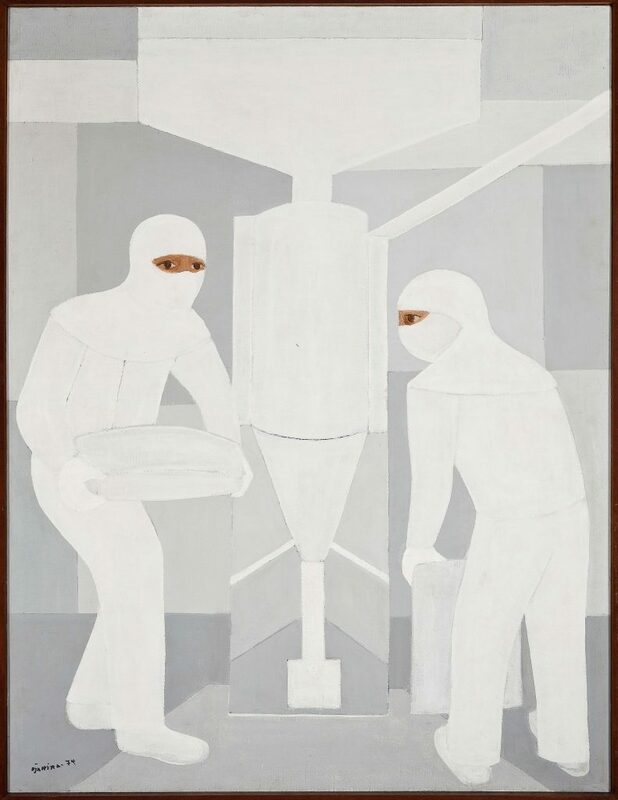 Was it the memory of these hardworking days that led her later as painter to portray the manual work of Brazilian common people in a way that reminds us of communist art? If she had leftist views how come she became a household name during Brazil’s hard-right dictatorship? She spoke against the dictatorship on several occasions denouncing its violence and arbitrary acts. Let me quote her again in a self-declaration note in 1962: “Do not misunderstand me, I am for democracy, nationalism, and for the self-determination of the people, I am anti-imperialist, against any state intervention in culture, and I practice the Catholic faith.” In May 1964, the state police arrested Djanira for inquiry. The episode led her to a period of relative, voluntary isolation that only ended by 1976, three years before her death. The visibility of her work was reduced after she passed. Tell us about the time she moved to Rio de Janeiro in 1939 and opened a boarding house where striving artists and European migrants lodged. Is that when she becomes attracted to the intellectual world? Djanira arrives in Rio at an intellectually effervescent time to live up the mountain in the bohemian neighborhood of Santa Teresa that, due to migration unleashed by WWII, had turned into a vibrant crossroad for different cultures and political views. She lodges at Pensão Mauá boarding house and starts running the place, subletting rooms to artists and intellectuals. It becomes a gathering point for European immigrants and Brazilians from other states. Then from 1944 to 1947, Djanira moved to the US, tell us about this period. Djanira’s US experience turned out to be quite interesting. She gets to New York in July 1945 having initially planned a trip only to Mexico to study mural painting technique. A year later, her friend, Chilean author Gabriela Mistral, suggests she apply for a scholarship at the John Simon Guggenheim Memorial Foundation. She does so with a letter of recommendation by painter Lasar Segall (1889-1957) but is not accepted. While on a visit to the New School for Social Research in New York to see the murals of Mexican José Clemente Orozco (1883-1949), she had the opportunity to show her work to Ecuadorian painter Camilo Egas (1889-1962), who was then gallery diretor, and invited her to exhibit her work at the institution from April to May 1946. It so happens the show was visited by First Lady Eleanor Roosevelt who hosted a radio program and talked about Djanira’s paintings, and also wrote about the Brazilian artist in her newspaper column, thus promoting Djanira’s name. 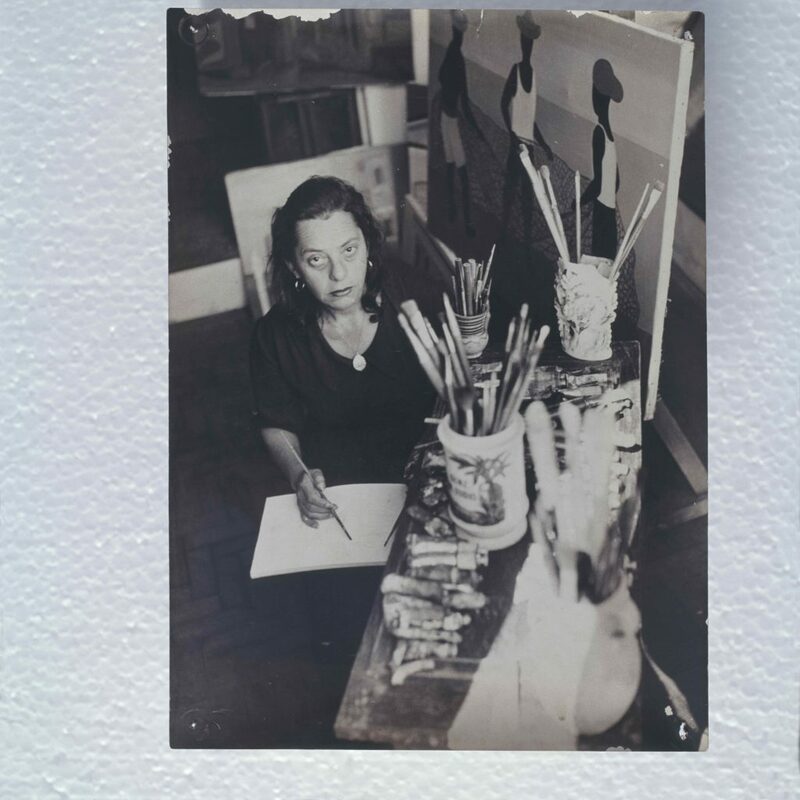 After that Djanira had a solo show in January 1947 at the Pan-American Union in Washington D.C. where she contacted local artists, associations and Brazilian expats, one of them sculptor Maria Martins, wife of the Brazilian ambassador in the US. 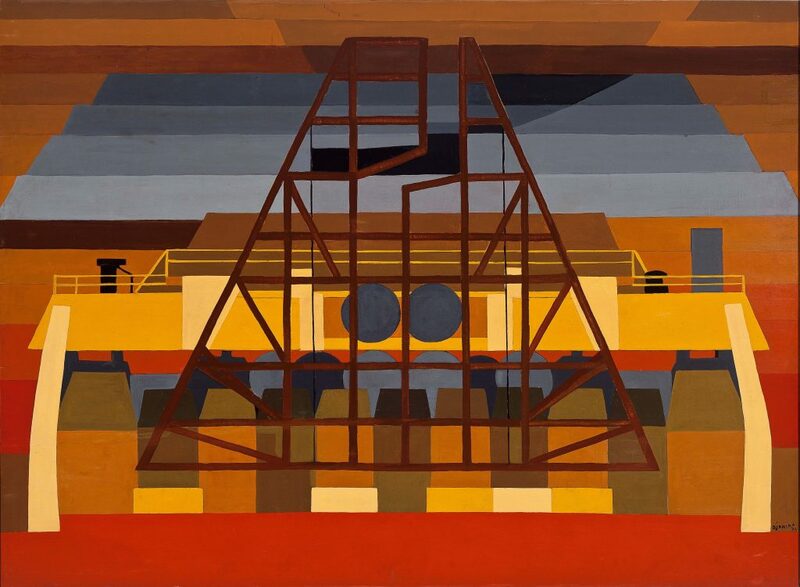 Back home in Brazil, the successful trip contributed to her recognition among the modernist artists. How would you divide the phases of her work? When is the peak of her career? 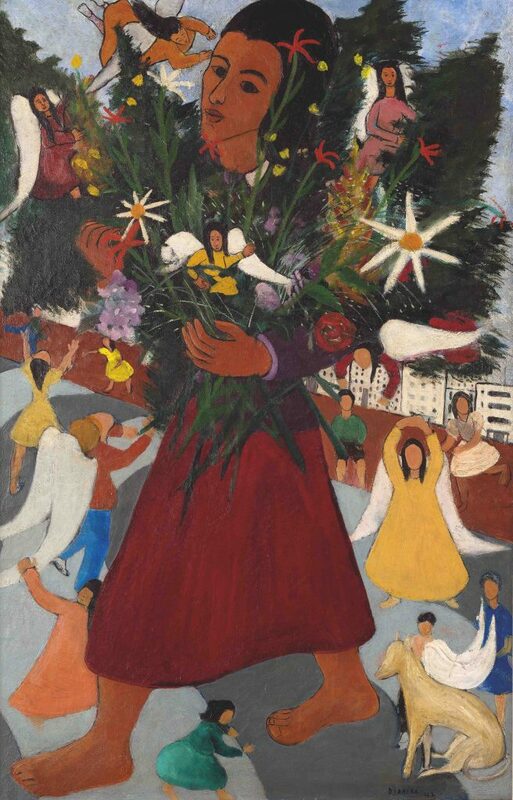 In the 1940s, as she starts in art, her paintings reflect an overall interest in portraiture and self-portraits, as well as scenes from Rio’s fringe neighborhoods and the divertissements of common folk. In the 1950s, Djanira engages in an in-depth research of Brazilian popular culture particularly of African origins. It becomes her most influential period because through her characteristic style she is able to create a dialogue with the constructive avant-garde of the day. 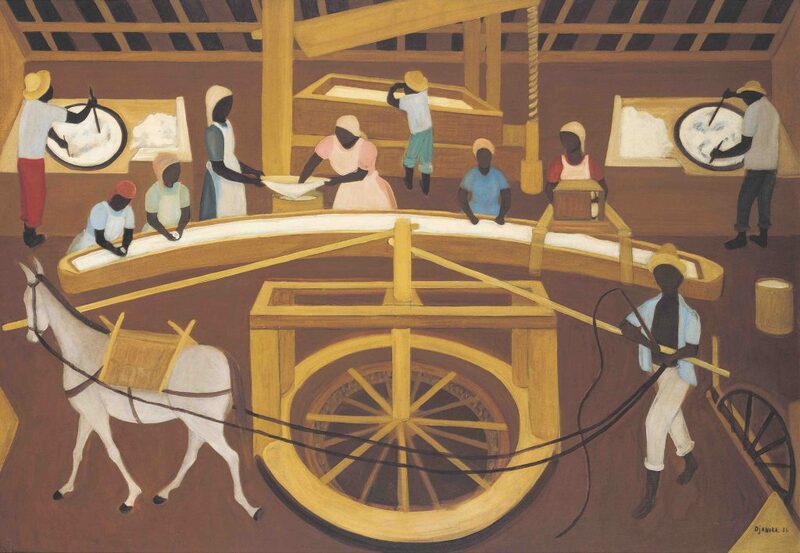 In the 1960s she produces several ceramic murals and engravings. In the beginning of the decade she travels to the Northern-Caribbean state of Maranhão and visits the Indian tribe of the Canela ethnicity, which inspires a whole series. The 1970s is the last decade of her production, with ups and downs, but it also comes with some highlight such as the series Minas e Minerações (Mines and Mining). All in all, she was able to have a very satisfying production in four decades. 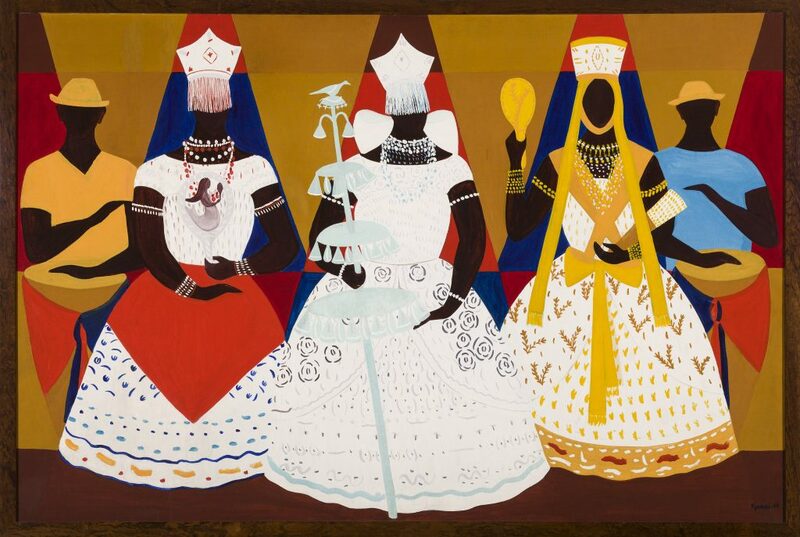 Tell us about the panel Candomblé (1957) she painted for her friend writer Jorge Amado. Djanira was always moved by social themes. She had a keen interest in unraveling the scenes in large format enlightening works. This 250-by-242-centimeter wooden panel clearly shows this purpose; it is probably her largest painting depicting Afro-Brazilian culture. The great Jorge Amado used to say candomblé was “a joyful religion that does not damage people” with “an enormous revolutionary power” to fight racism in Brazil. 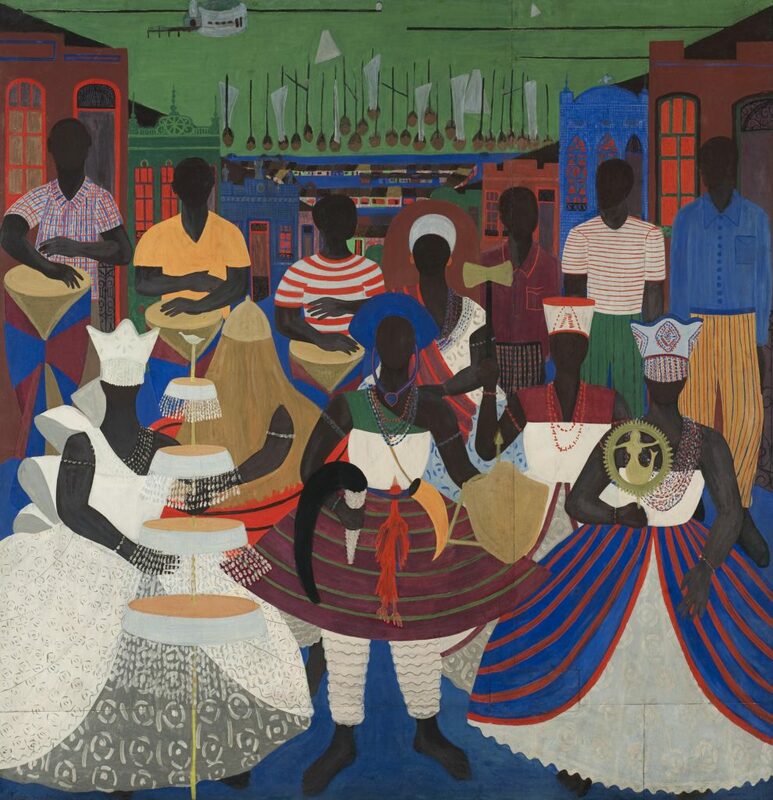 Djanira’s panel is an ode to candomblé in all its splendor with Bahia’s capital, Salvador, in the background. To wrap up, what is painter Djanira’s legacy?